Sharp unveils new 2010 Aquos 'Quattron' QuadPixel TVs | What Hi-Fi? There will be three model ranges in Sharp's 2010 Aquos range: the LC-LE921E, LC-LE821E and LC-LE811E, ranging in price from £1400 to around £2500, plus a flagship 60in version, the LC-60LE920E. All are equipped with Freeview HD tuners and Sharp's proprietary 'Quattron' QuadPixel technology, which introduces a fourth colour sub-pixel, yellow, to the traditional red, green and blue. "The revolutionary new four-colour technology enables billions of colours to be displayed, creating more sparkling golds, emerald greens and Caribbean blues," claims Sharp. Well, at least they're only claiming billions of colours, rather then the trillion colours the company claimed at CES in America back in January. The new sets come in 40in and 46in sizes across all three ranges, while the flagship LC-60LE920 (shown) is a 60in model. Every set is Full HD/1080p compatible, and they all have Sharp's UltraBrilliant Edge-lit LED technology as standard. They're just 39mm deep, and the panel glass on the LE921 and LE821 series extends to meet the edge of the TV for a more seamless look. LED backlighting reduces energy consumption over that of conventional fluorescent-backlit LCDs, says Sharp, and every set has an eco picture control. The LE921E models have the added benefit of E-motion 200Hz motion processing. 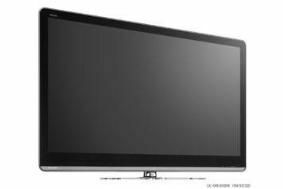 However, noticeable by their absence were any new 3D TVs in the 2010 Sharp line-up. They won't be coming until the latter part of this year, with a launch planned at IFA in Berlin during late August. "We're still slightly nervous about some of the issues around 3D TV," explains Sharp UK managing director Paul Molyneux. "The 3D message is still not clear, and there's currently a lack of content. We haven't discounted 3D TV, and are observing developments, but for now we're concentrating on a technology that exists – Quattron." Equally absent at today's launch were any new Blu-ray players. Sharp demonstrated a 3D model at CES, and this is "under consideration", says Molyneux, but it won't appear in Europe during the first half of this year. What we will get, in April, are two new Freeview HD set-top boxes. The TU-T2 model is a straightforward Freeview HD receiver and will sell for £179. The TU-T2HR32 is a 320GB PVR, which will go on sale for £299. We're off to Sharp's UK press launch shortly, which is due to begin at 5pm. We're expecting to get details of all the UK-spec Aquos TVs for 2010, some of which will feature Sharp's proprietary QuadPixel technology, first revealed at CES in January. As the name suggests, QuadPixel adds a fourth primary colour (yellow) to the ubiquitous red, green and blue – this enables more than a trillion colours to be displayed. This four-colour technology, then, is imaginatively called RGBY. QuadPixel is expected to feature on the new Aquos LE920 TV, due this Spring – pricing is yet to be confirmed. The LE920 also features LED edge-backlighting and 200Hz motion processing. Other models in the range will, if what we saw in the US is replicated here in the UK, include the LE820 and LE520 ranges. There should also be news of a standalone Blu-ray player, and Blu-ray home cinema in a box system. Join us here on whathifi.com later this evening for live updates from the launch, or follow us on Twitter.